I now have a new page on my blog about wholesale purchasing. There you will find my brand new catalog!!! It features some of my most popular designs. I am so excited to be venturing down this path. Please note the prices listed in the catalog are for wholesale purchase by brick and mortar shops for resale to their customers. My retail customers will notice prices in the wholesale catalog are lower than what they may have purchased an item for. Why is retail more? One of the biggest reasons is the time involved. Wholesale is quick with little time investment for me. Retail requires a huge investment of my time and resources sitting in my booth at various events around the area. I use a pretty standard formula to determine my prices that uses 3 things: time, overhead and materials. Add these together for the cost of an item. Double this number for wholesale. Double the wholesale figure for retail. Time: I pay myself a modest hourly wage. I use a timer to see how long it takes me to make an item. This can range from 10 minutes to several hours. Overhead: This is 33% of my time. Overhead includes a myriad of things. The creating of tags and ear cards, cost of office supplies, studio expenses, marketing, vendor fees, booth equipment, and many, many more costs that I incur in the operation of my business. Materials: This is the actual cost of the materials used in the making of an item. I try very hard to buy things on sale and in large quantities to keep my prices reasonable. When I bring home a purchase of supplies I figure out the cost per piece. Here is a simple example: Let's say it took me 1/2 hour to make something and my rate of pay is $10. That is $5. Plus overhead of 33% is $1.65. Cost of materials is $5. So the cost of this item is $5+$1.65+ $5 = $11.65. The wholesale price is then $23.30 and the retail price is $46.60. That means a "profit" of $34.95 on this item. I put profit in quotes lest you think I am getting rich on all of my profit - not going to happen! I am just happy to cover all my expenses. In the retail world many businesses will charge much more than double of wholesale for the retail price. Often in a shop they may take the wholesale price they purchased the item for and as much as triple it for the retail price. I have seen this on some of my own pieces. I may also add into the wholesale price the cost of working with a sales rep (usually 15% of the price). I will also look at the retail price and consider how it relates to similar items I have in stock and what I think someone would pay for it and adjust (up or down) accordingly. Does your head hurt yet from all this math?! Luckily you can leave all this to me and just enjoy shopping and wearing my beautiful jewelry instead! I have been making these bracelets for many years and they continue to be very popular. I sold out of them at my last show so made a few more for this weekend. They feature furnace glass or cane glass beads (the chunky multicolor beads) mixed with an assortment of colorful glass beads and silver accents. The toggle clasps all have a small handcrafted silver dangle for a fun attitude. This shimmery grey necklace started out very differently with a large zebra jasper pendant, but I was not happy with the way it was looking so I took it in a different direction. Instead it is 3 strands of grey and shimmering grey glass seed beads with a delicate crystal dangle. This has SOLD. Yesterday I met with a wholesale rep who wants to represent me at stores through out western Washington!! She said she picked me because my jewelry is unique, I have a nice variety, a good price point, and am a local small business. How flattering! Thinking about all the various aspects of this is a bit overwhelming. I left the meeting with a list of homework assignments. Things to research, things to ponder and things to create. Much of my work is one of a kind so how do I combine it to make it easier for a store to order from me? Which items and styles should I choose to start with? What samples should I provide to the rep and how to package them? What will be my polices on payments, orders, returns, and shipping? What will be my minimum order amount? If successful will I be able to keep up with orders? I will need to create a wholesale line sheet, wholesale price sheet, a leave-behind post card or sheet (someday a catalog, but that is for the future), order form, packing slips, invoices, new tags, and a contract. Luckily I have a few artist friends who have traveled this road and they are willing to share info with me. There is also a wealth of info on the web. My goal is to have all of this figured out before Christmas so that I am ready for my rep to begin marketing me in January. My rep - that has a nice sound to it! So much for down time this month! 2013 looks to be an exciting and scary year for Beadware!! As of this afternoon you can now find a selection of my whimsical bead art pins, a party on a pin!, at the Crazy Lady on Bay Street Gallery and Gifts in downtown Port Orchard. Shelly Wilkerson took over this gallery last month and is amassing a collection of whimsical and fine art from around the region. I will be adding more items through out the month of December. Check out her Facebook page for more info on the gallery and artists. Stop in the next time you are in the area and be sure to say hello to Magic the gallery cat. A few new necklaces from yesterday and today's work. If you see something you like send me an email before it gets sold at an upcoming holiday show! and glass seed beads. The clasp is copper. SOLD. glass seed beads and copper with a copper clasp.The earrings have SOLD. glass seed beads with copper accents and toggle clasp. seed beads in a rosy copper color. SOLD. Found time this week to make a few bracelets to go with some dainty necklaces I made earlier this month. These are in blue, a steely greenish grey, lavender and purple. The chain makes them adjustable for any size and they could even be worn as ankle bracelets. Now it is time to go pack the car for this weekends show, Winterfest at Peninsula High School in Gig Harbor. All of these have SOLD. A very busy week, but I did find time to make a few new things. Pretty blue bracelets with a variety of Czech and Swarovski crystals in a myriad of colors. Matching earrings too!All have SOLD. A few more colors of this pretty and delicate glass necklace. Pearlized seed beads with a yellow glass faceted teardrop. Sold. Shimmering orange seed beads with an orange glass faceted teardrop. Sold. Dark orange seed beads with an orange glass faceted teardrop. Sold. Pale topaz seed beads with a gold glass faceted teardrop. Sold. Dark topaz seed beads with a gold glass faceted teardrop. Sold. A dainty little necklace in a variety of colors - with even more to come. Bluish grey seed beads and soft green chalcedony. Sold. Pale and dark gold with gold glass faceted teardrops.Sold. Pale lavender or dark purple with matching faceted glass teardrops. Set up is almost complete for my annual holiday sale this weekend. Miko is ready to greet shoppers and help you pick out an ornament. Featuring work from Beadware, Flamewerks Glass Studio and Side Door Pottery. Saturday musical entertainment by Past Tunes 1 to 3pm. Fresh off my work table this morning are these 4 beautiful needle agate necklaces. Agates are a birthstone for Taurus (April 20 - May 20) and September. Agates will chip and crack so you need to protect them from scratches and sharp blows. Avoid sudden temperature changes and household chemicals. For healing abilities agates are said to be a cooling stone, reducing fevers and quenching thirst. It quiets the pulse and insures good health and a long and prosperous life. Mystically agate is thought to guard against danger. They have grounding and centering properties. Wearers become temperate and cautious. It can help you view the world with a broader viewpoint and see yourself with more clarity. Wearing agate is also thought to cure insomnia and to insure pleasant dreams. Both the one above and below have sold. Red Dragons Blood Jasper. Now that is a perfectly named stone to work with a few days before Halloween! This Australian jasper is said to bring joy to community interactions. It helps to increase straighten and courage. Physically it aids in healing of the heart. It also grounds spiritual energy though the heart chakra. 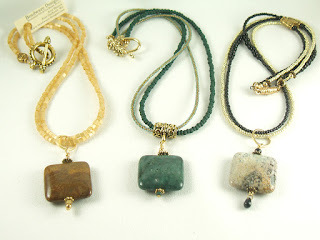 I've used some interesting color combinations with this series, picking out various colors within each of the stones. Yesterday I had two customers visit me in my studio to do some custom work. The first was to match an unusual opal pendant. We dug through my bead boxes and sorted through stones. In the end what did the trick was two orphan glass beads. Happy to see them now made into beautiful earrings to keep the pendant company. Unfortunately I did not get a picture for you. The afternoon was spent designing two holiday gifts. First we went through all the necklaces I had made looking for just the right pendant and color. When we did not find exactly what the customer was looking for we then sorted through stones looking for the perfect pendant. Next we flipped through pictures of past designs on my computer. Once we had a design and several pendant options we then looked for the perfect color match for the necklaces. We decided on appropriate lengths and matching earrings. Here are the results. A long (24") necklace of garnet red glass seed beads with a faceted glass teardrop at its center. We chose the longer length to allow this wearer to slip this necklace on over her head. Easy for arthritic fingers! This necklace features a pendant of fancy jasper, Swarovski crystals and glass seed beads in a Caribbean blue with earrings to match. It is fun to share my love of beading! If you would like to schedule a studio shopping day please contact me via email. Pins, pins and more pins, I am up to me elbows in pins this week! A new one, black and white! With a touch of red. All these plus multi-color and holiday (red, silver and green) are now available at my various holiday shows and will soon be in stock at Old Town Frame and Gallery in Silverdale! Today is all about Pins! I finsihed up a batch of autumn browns and golds. Next up are greens and blues, then onto a new color - black and white. Invitations are out! If you don't see one in your email inbox then you are not on my mailing list. Contact me to receive your personal invitation to this annual event. Kick off your holiday shopping in a relaxed and intimate atmosphere. Get the first peek at new Beadware designs, before they are snapped up at the holiday shows! Purchase beautiful garden photo note cards and support the programs of the Master Gardener Foundation of Kitsap County. Mona Gollan of Flamewerks will have a selection of gorgeous lampworked glass beads and spinning wheel orifice hooks. Browse delicate pottery by Linda Ricci of Side Door Pottery. Can't make the sale? Check out the events tab on my blog to find me at other holiday venues, shop online or contact me for a studio shopping day.